Practice Genetic Engineering questions and answers for interviews, campus placements, online tests, aptitude tests, quizzes and competitive exams. This set of Genetic Engineering Multiple Choice Questions & Answers (MCQs) focuses on “Restriction Endonucleases & Phosphatases-01”. Explanation: The cleavage is done within the polynucleotide chain and not at the ends. The enzyme which cuts the sequence at the ends is known as exonuclease. 2. The restriction endonuclease is having a defence mechanism in bacterial system against foreign DNA such as viruses. But how it is able to protect its own DNA? Explanation: The bacterial DNA is methylated by restriction enzyme and thus now it is not recognized by the restriction endonuclease. Thus methylation prevents the restriction endonuclease from cutting its own DNA. 3. Even after replication, how the modified DNA remains protected? Explanation: Because of the semi-conservative mode of replication, one of the DNA strands remain methylated even after replication. One methylated strand is sufficient for providing protection against cleavage by restriction endonuclease. 4. How many classes of restriction enzymes are there? Explanation: Three classes of restriction enzymes are there, I,II and III. These classes are having different characteristics such as the site of cleavage on the basis of recognition sequence. Explanation: Recognition sequence is the set of nucleotides which are identified by the enzyme and then it cleaves. In class II, the cleavage is done within the recognition sequence. Explanation: Either the ends are both double stranded or are both single stranded. The double stranded ends are blunt ends whereas the single stranded ends are sticky ends. 7. A sequence is having two ends, 5’ and 3’. Which of the following statements is correct regarding the nature of the ends? Explanation: The 5’ end is having a phosphate group. As in a DNA sequence, the 5’ end is characterized by phosphate group and the 3’ end is characterized by a hydroxyl group. 8. Blunt ends created by the restriction endonuclease can be joined. True or false? Explanation: The blunt ends created can be joined by the enzyme responsible for ligation such as DNA ligase. It is not necessary to have sticky or single stranded ends. 9. The recognition sequence for BamHI is 5’ G|GATCC 3’. The ‘|’ represents the cutting site. What can be inferred about the ends from it? Thus, we can see that the ends generated are single stranded at 5’ end. 10. The recognition sequence of Sau3A is 5’ |GATC 3’ and that for DpnI is 5’ GA|TC 3’. Which of the statements is true? Explanation: Though, the recognition sequence is same, the ends are not compatible. It is so because both the enzymes leave double stranded ends and thus can’t be ligated. 11. The recognition sequence is at times palindromic in nature. Which of the following statements is correct in respect to it? Explanation: The term palindromic can be used only when sequence is read along the same polarity ie either 5’ to 3’ or 3’ to 5’. When the recognition sequence is palindromic in nature, there are increased chances of annealing because now there are increased orientations. If the sequence is non-palindromic in nature, then also annealing would take place but in fewer orientations. 12. If all the nucleotides are present with equal frequencies and at random, what are the chances of having a particular four nucleotide long motif? Explanation: There are four nucleotide bases present in a DNA sequence A, T, C and G. If the bases are present with equal frequency and at random the chances of having a particular 4 nucleotide long motif is 1/ (4*4)= 1/256. 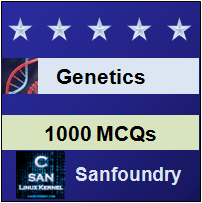 Sanfoundry Global Education & Learning Series – Genetic Engineering. To practice all areas of Genetic Engineering, here is complete set of 1000+ Multiple Choice Questions and Answers.